Vineyards in Stellenbosch, near False Bay. I have been visiting South Africa semi regularly now for well over 10 years and over that time the wines have continued to improve and become even more exciting. Very few places can touch South Africa’s Western Cape – the main centre of wine production – for sheer diversity, whether it is in soils, altitude or aspect. This allows them to grow an extraordinary array of different grape varieties and they put this to good use by producing an incredible variety of wines, often from quite a small area. The Cape is very beautiful too, which makes it a real joy to visit. What’s more the wine regions are all pretty compact and most of the estates are within an hour or 2 of Cape Town airport. I love visiting the place, the beauty of the place never fails to get to me. 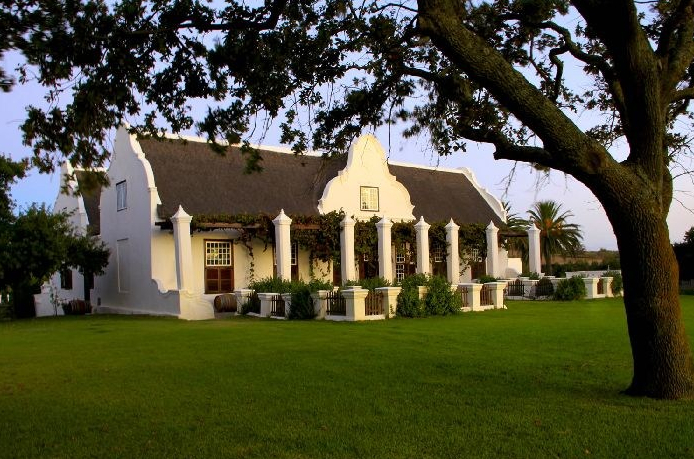 Many of the wineries are old with the charming Cape Dutch architecture. Even the modern ones are lovely places to visit, as they are usually very well geared up to receive visitors and most have good restaurants too, like the excellent Terroir at Kleine Zalze. But even if they don’t it doesn’t matter as Stellenbosch, Somerset West, Paarl and Franschhoek are all full of lovely places to eat excellent food and drink good wine. As far as wine is concerned, the place produces such variety that it is hard to say what is best, but I have been seriously impressed with many South African Sauvignon Blancs recently, especially this one and this one, they really are world class and can often give great value for money too – like this one here. As for reds I am struggling to single out trends, as so many styles from the Cape are good. I still admire this Cabernet Franc from KWV, which was a former Wine of the Week. The Chocolate Box blend from Boekenhoutskloof is also hugely impressive and enjoyable and there is much else to enjoy, including some superb and enjoyable examples of Pinotage and this lovely Sangiovese. However, last night I showed a very exciting South African Bordeaux-blend at a tasting. I have tasted the wine many times before from previous vintages and it never fails to impress, as well as to offer great value for mine, so I made it my Wine of the Week. 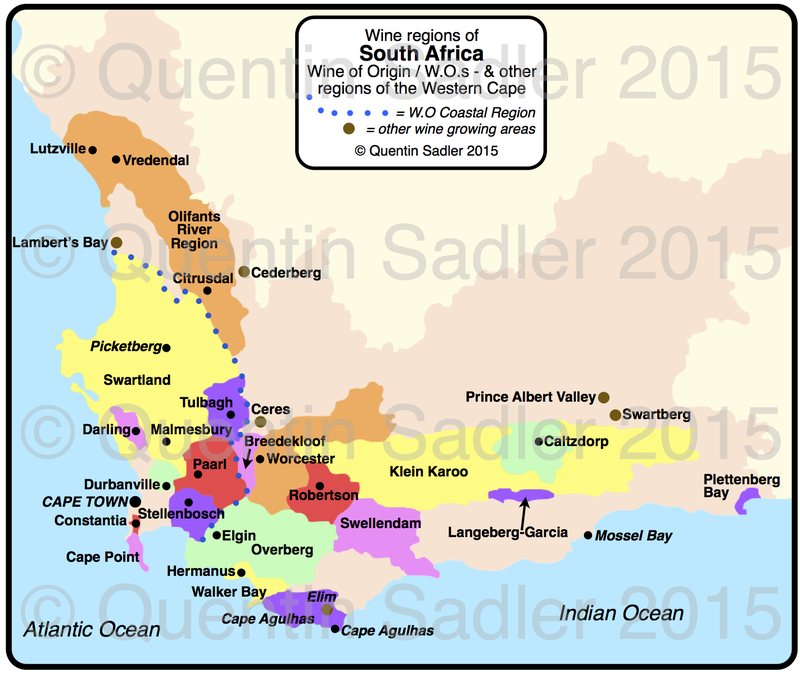 Wine map of South Africa’s Western Cape – click for a larger view – non watermarked PDF versions are available by agreement. Bordeaux blends, wines made from a blend of the grapes that are famously used in Bordeaux, Cabernet Sauvignon, Merlot, Cabernet Franc, Petit Verdot and Malbec (Cot) are a very traditional South African style and something of a speciality of the Stellenbosch area, so are well worth trying. This one is from the venerable Meerlust Estate, which has belonged to the Myburgh family since 1756, but was actually founded in 1693. Situated very near the sea in False Bay, southern Stellenbosch, the site benefits from cool ocean breezes and mists that temper the extreme heat of summer and must have made the place a logical place to build. The name Meerlust apparently means ‘pleasure of the sea’, but I do not know in what language – as far as I can detect it is neither German, the original owner was German, Dutch or Afrikaans. I can get sea in the meer bit (mer), but cannot help feeling that lust implies something more than pleasure! 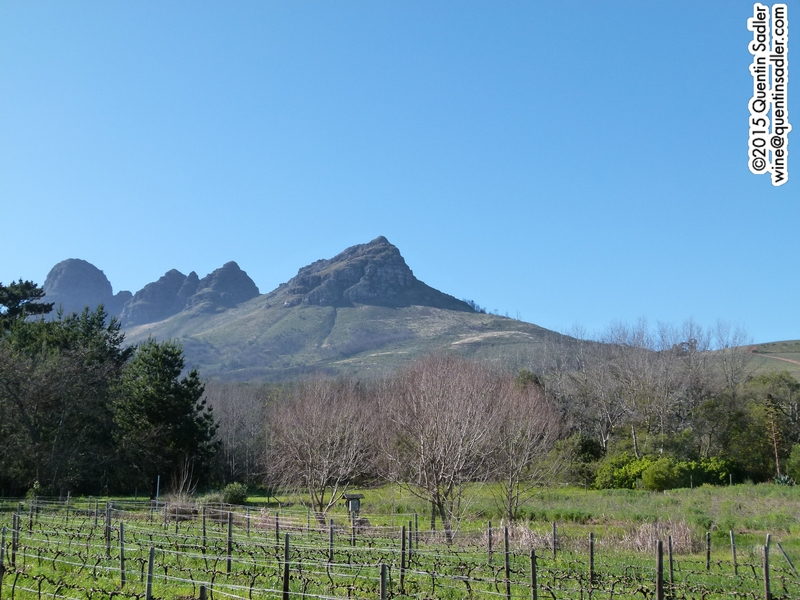 Whatever the name means though, it was a fortunate site to choose for wine too, as the cool conditions allow Meerlust to produce excellent Pinot Noir and Chardonnay too. However their main focus has always been their Cabernet Sauvignon and Merlot blends – Meerlust Rubicon is their Grand Vin – as well as some single varietal wines. My Wine of the Week is in effect their second wine made from younger vines and declassified vats, but it is still very good indeed. Meerlust, photo courtesy of the winery. A blend of 37% Cabernet Sauvignon, 31% Merlot, 23% Cabernet Franc and 9% Petit Verdot aged in 55% new French oak. Frankly this is more like a classic Claret from my youth than most Claret nowadays. The nose is fragrant and scented with very attractive leafy herbaceous notes, not green though. Just behind this there is plenty of vibrant fruit too, cassis, plums and a touch of blackberry. However the fruit is delicate and more European in style, rather than lifted, rich and sweetly ripe, as drinkers often expect from the new world. There is also a little touch of leather, cedar, pencil shavings, mocha and espresso bean, that all give a nice feeling of complexity and elegant sophistication. The palate is medium-bodied and fresh tasting with some nice cleansing acidity balancing the succulent ripe fruit that gives cassis, dried and fresh, a touch of creamy vanilla, mocha again and some attractive leather too. The tannins are lovely and ripe, with a nice fine-grain texture giving just a little touch of astringency to the finish, which gives the wine some nice focus and definition – structure is the official word. The freshness really dominates the finish, which adds to that sense of focus and poise in the wine, while the finish is extraordinarily long. I love this wine and think it would happily grace a dinner party table as well as being great value for more frequent drinking. Perfect with Sunday roast, game, meat and semi-hard cheese – 91/100 points. Available in the UK for around £11 a bottle from The Wine Society, Winerack, N.D.John, Lea and Sandeman, South African Wines Online, Slurp and Exel Wines – more stockist information is here. Meerlust wines are distributed in the US through Maisons Marques & Domaines. If you like classic Bordeaux wines you will certainly enjoy this, but even if you have never tried a Claret it is still a delicious wine that will find favour with almost anyone who enjoys Cabernet Sauvignon or Merlot.